We are the 501(c)(3) advocacy non-profit for people on bikes in the Greater Cleveland area. Representing over 1000 due paying members and more than 32 local businesses, we make sure that any time the conversation turns to transportation — that people on bikes are being considered alongside people in cars. We work to improve policy, infrastructure, and legislation to help make our roads places that serve people and communities, not just traffic. Our efforts are broad, and we have achieved a lot in our short history. If you care about sustainable and equitable transportation, join the movement! Bike Cleveland is creating a region that is sustainable, connected, healthy, and vibrant by promoting bicycling and advocating for safe and equitable transportation for all. Greater Cleveland neighborhoods are connected by a multimodal transportation network where the rules of the road are understood by all. A network of well-designed bikeways and walkways allows all people to safely navigate our communities. Biking, walking, and access to public transit are convenient, safe, used by a majority of people, and a source of pride in our community. Safe and inviting multimodal facilities are a civil right, and transportation choice is essential to a high quality of life and economic growth. We engage and educate communities, institutions, and civic leaders to promote that belief. Our work builds a strong network of advocates through our members, local chapters, bike groups, volunteers, supporters, and communities who are essential in accomplishing our mission. We fully integrate equity and diversity in our work to ensure our movement grows inclusively across the region. We demonstrate what is possible through projects, outreach and events. Innovation and best practices – We embrace creative solutions that increase biking, walking, and the use of public transit to improve health, vibrancy, and quality of life for all Greater Cleveland residents. Access and Connectivity – All residents and visitors should have safe access to a low-stress bike, walk and public transit network that connect people with where they need and want to go. Health and Environment – Transportation choice and recreation options play a crucial role in reducing greenhouse gas emissions, improving air quality and the health of Greater Clevelanders, while also promoting active lifestyles and vibrant communities. Equity and Inclusion – We listen to and actively engage all people in shaping our work and the region’s transportation infrastructure to ensure we are building a system that meets the needs of diverse users. Organizational Sustainability – Our work is sustainable: we are fiscally, ethically, professionally, and environmentally responsible with our resources. Community Responsibility – We harness the power of the community and civic leaders to effect change through open communication, collaboration, building trust, and diverse engaged public participation. Advocacy – We work for safe streets and public spaces through policy change and advocating for best practices in bikeway/walkway design and maintenance, resulting in an equitable transportation network. Education –We provide education and training to increase knowledge and skills necessary to walk and bicycle safely, and educate drivers and decision makers on the rights of bicyclists and pedestrians. Communication – We communicate effectively with our supporters to inspire engagement and action, and to the general public to build broader support for safe biking, walking, and public transit. Organizational Sustainability – We cultivate our resources, both financial and human, efficiently and effectively to ensure long term growth of the organization and its work. Equity and Inclusion – We view all our programs and advocacy campaigns through a lens of equity and inclusion to ensure our work addresses the needs of Greater Clevelanders who have historically been marginalized by transportation system decisions. Community – We grow diverse, engaged communities by focusing on outreach, fun events, and membership and by building the next generation of advocates. Worked with Cuyahoga County Department of Sustainability to secure the funding needed to bring large scale bike share to Cleveland in 2016. 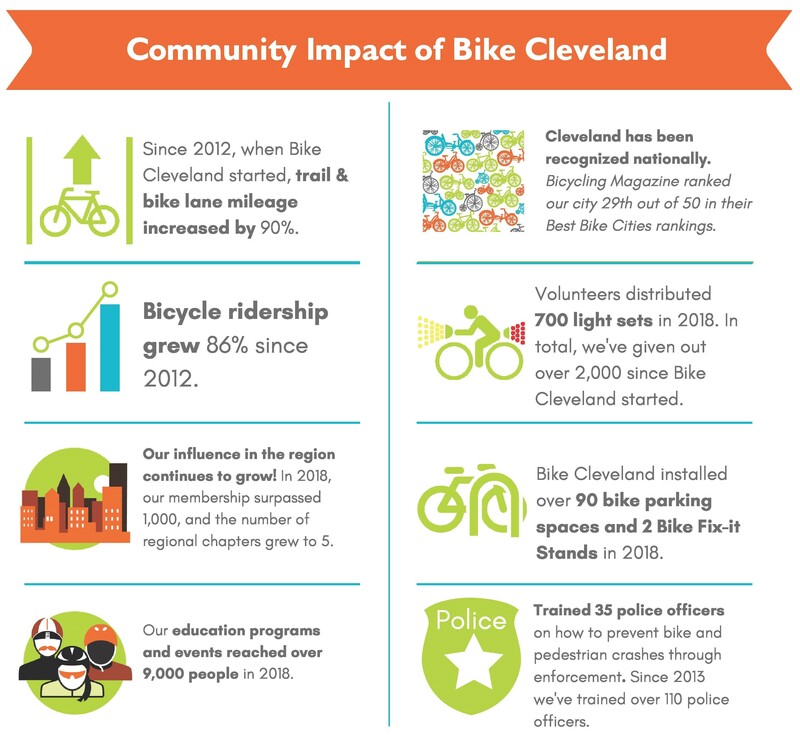 Bike Cleveland was responsible for releasing the RFP and raising the local match. Launched the “We’re All Drivers”, a public awareness campaign to humanize cycling and raise awareness around road rights for people on bikes. The campaign has seen over 800 million media impressions. Trained over 200 police officers from across Greater Cleveland on how to enforce laws to prevent bike crashes and save lives. Played a pivotal role in passing the 3 foot passing law in Cleveland and making it statewide. Helped bring covered, secure bike parking known locally as bike boxes to Cleveland. Worked closely with the City of Cleveland to help formulate and fund Cleveland’s Complete and Green Streets Typologies Plan. Successfully advocated for a design change to the Opportunity Corridor to better serve bikes and pedestrians; granting safe and easy access to the new road for the thousands of local residents without cars. Our work helped Cleveland qualify for the League of American Bicyclists Bronze Bicycle Friendly Community designation in 2013 and 2017. Distributed hundreds of light-sets as part of our “Random Acts of Brightness” program, helping people without the financial means for costly lights to stay safe and legal while riding at night. Worked with the City of Cleveland and local partners to develop a plan for a network of protected bike lanes, The Midway and the Lorain Avenue Cycletrack which have both received construction funding from NOACA. Secured federal, state and foundation funding to implement a city-wide Safe Routes to School Travel Plan in partnership with the City of Cleveland and Cleveland Metropolitan School District. Installed secure bike parking and repair stations in Cleveland neighborhoods and continue to work with local businesses and organizations to include quality bicycle parking at their locations. Advocated for the addition of over 65 miles of bike lanes on Cleveland Streets, including Cleveland’s first green painted and protected bike lane on the notoriously dangerous Detroit Superior Bridge. Have educated hundreds of youth and adults how to ride safely on Cleveland streets through our BikeSmarts and neighborhood outreach programs.